With Robin and Marian, we get a more contemplative take on the Robin Hood mythos, one that touches on the themes of love lost and found. 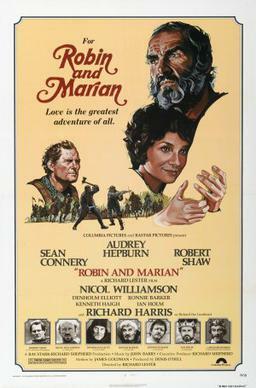 It may have its off moments, but by and large Robin and Marian is a surprisingly quiet and moving film. Robin (Sean Connery) is nearing the end of his time in the Crusades with tyrannical Richard the Lionheart (Richard Harris). Robin and his BFF Little John (Nicol Williamson) are almost executed by Richard when Robin refuses to destroy a castle with no defenders, only women and children. Fortunately, Richard dies of an arrow wound and grants them leave. Robin and John return to find that the Sheriff of Nottingham (Robert Shaw) is still there, still sucking the life out of the people. All the old gang have either died or gone off in the twenty years since Robin went crusading, with only Will Scarlet (Delholm Elliott) and Friar Tuck (Ronnie Barker) still around. They urge Robin to resume his outlaw ways, but Robin is essentially retired. He does, however, want to look in on his great love, Maid Marian. It comes as a surprise that Marian (Audrey Hepburn) is now Mother Jennet, prioress of an abbey. She says she isn't happy to see Robin after all these years, and to be fair she has greater issues at hand. The Sheriff, along with Sir Ranulf (Kenneth Haigh) are enforcing King John's decrees regarding his war with the Pope. One of those laws is that any high churchman has to either leave or be arrested. As the Mother Superior, Marian falls under that law, and she is willing to be imprisoned. Robin, however, won't hear of it, and quickly (and forcefully) spirits her away. Sir Ranulf is enraged, while the Sheriff seems more amused. The Sheriff takes a more cautious and steady approach, convinced Robin will come to rescue the nuns he's arrested as a trap. The Sheriff knows his man, but he's still thwarted by 'these old men'. Despite herself, Marian still loves Robin and they resume their romance. Sir Ranulf gets both men and permission from King John (Ian Holm) to lay siege to Sherwood Forest, something that again amuses the Sheriff. The wily lawman goes to the edge of the forest...and waits. This confounds the Merry Men and grates at Robin, who ultimately decides against Marian's wishes to challenge the Sheriff to a single match, winner take all. The fight ends, after a while, with the Sheriff's death and Robin wounded. The Merry Men do manage to eke out a win and Marian, with John's help, takes Robin to the abbey. Robin thinks he will recover from his wounds, but Marian instead has poisoned both of them. She declares with her dying breath that she loves Robin totally and absolutely. "I love you more than God," she says. Robin, aware that both will die, asks John for an arrow and his bow. He fires it out the window and gets John to promise to bury them together wherever the arrow lands. Robin and Marian starts out a bit badly thanks to Harris' wild over-acting. Even though he and Holm are there essentially making cameos (Holm could not have been on the screen for more than five minutes), Harris manages to look deranged and theatrical. It's not a pun when I say someone should have reigned in Harris as he all but does a jig as he is dying. Once we get to England, however, Robin and Marian becomes a pleasant romance. This is thanks to the work of our two leads. 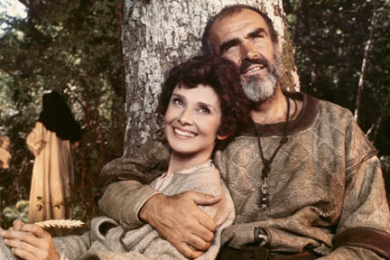 Connery might have made for a fascinating Robin Hood early in his career, but here he seems suited to play a more worn-down, more weary Robin. He still has some vim and vigor to his outlaw, a touch of joie de vivre given what he's endured. However, he is also later on moving and gentle with Marian. I say 'later on' because in the beginning he is very chauvinistic towards her. He forces her to escape despite her own wishes and seems content to think little of her views. As the film progresses, you see he is motivated by love, even if he goes about it the wrong way. Then we get Marian, and more proof that Audrey Hepburn was fashioned by God Himself. Even as she aged, she remained breathtakingly beautiful and elegant. I read it somewhere that Hepburn never thought of herself as attractive. With all due respect, this is the only time I can think of where Audrey Hepburn was completely wrong. Apart from the grace Hepburn lends to the film, her performance is equally lovely. Her Marian, Mother Jennet was strong yet vulnerable, strong in her love and strong in her views. Perhaps her best moment was at the end, where she speaks to the dying Robin of how much she loved him. To say she loved him more than God is blasphemy, especially for a nun. However, she mentions other things, like loving him more than children or prayers or peace or food. This is a woman in love, but one who had accepted a life without her love until he came back. I found Shaw to be less a menace and more a bystander, albeit one who seemed more shrewd than malevolent. His Sheriff is a cool customer, one not fazed by anything and used to having his own way. There was a surprising lack of action with him, but perhaps that was to counter Haigh's sneering Sir Ranulf. It's here where things get a bit odd. At times, Robin and Marian looks a bit like deleted scenes from Monty Python & The Holy Grail. From the costumes (The Knights of Nee In The Desert) to Sir Ranulf's somewhat broad manner to Delholm Elliott breaking out songs (a casting I found a touch curious), there were moments when the film was in danger of slipping almost into farce. A particular moment is when Robin and John are planning to rescue the nuns, with their merchant wagon and haggling with other merchants. That being said, Robin and Marian has an ace up its sleeve: John Barry's beautiful score. It's lush and romantic and elegant. A wonderful moment is when Robin and Marian finally see each other. As Mother Jennet says she is not happy to see Robin, the music tells you otherwise. It tells you that she is still deeply in love with him and is overwhelmed to see him again. Barry shows he was one of the best composers around, sadly underappreciated, who should be better remembered. He was the equal of a John Williams or Max Steiner, and Robin and Marian is one of his great works. Robin and Marian is at times a raucous film but it is also a heartfelt love story. The ending might surprise people but on the whole, this is a film of a lion in winter, who has one last roar left to him.